TV Show Idea: Who Am I To Ask? My last tv show idea was, admittedly, just not going to cut the mustard, whatever that's supposed to mean. I mean, who cuts mustard? It's spreadable. Enough mustard talk, I have a new show idea that is way better than Tommy Tomato. It's about a detective who gets clues not from a pimp nor ho, but from Ask Jeeves. Fred Spot is a detective who is having trouble solving his cases. Usually his clients end up canceling and going to the bigger, non-private, investigators. This has left Fred in a hard place. His rent and utility bills are becoming due rather quickly. Life is hard for a private investigator in Davenport, Iowa in 1997. On a case, Fred wanders into a mall during a chase. He's on the trail of a real shady character. He's in the food court looking around and he sees a smartly dressed woman near an arcade cabinet-esque machine. He approaches her and his life is changed forever. She shows him the internet, and more specifically, the Ask Jeeves search engine. "You're telling me that I can ask any question to this Jeeves fella and he'll tell me the answer. All I gotta do is hit that 'ask' button?" Fred is beyond himself. "That is right, sir. Go ahead and give it a try." Fred types in "Where is my suspect in the North Park Mall?" and like clockwork is given the answer: "Footlocker." Fred thanks the lady, and Jeeves, and quickly runs to the Footlocker. Fred encounters his suspect, who is going crazy in the shoe store. He's throwing sneakers around like he's practicing for the Mississippi Valley Fair's famous shoe hurling competition. Fred deflects a Puma and tackles the suspect. A brief scuffle ensues and Fred cuffs the man. The gathered crowd cheers. That's Fred's office rental money right there. In 1997, there is a huge drug trade migrating into Davenport. After seeing Fred in the newspaper for his daring capture at the mall, the police ask him to help out with capturing the druglords. Fred, of course, would love to and he could use the steady pay. This will set where the series is headed in much of the first season. Fred is divorced like all great TV private dicks. He spends a little time with his children, but not as much as he'd like. His ex-wife has remarried, and her husband, Gerald, gives Fred constant grief, including telling him how to raise his own kids. Fred, with the help of Jeeves, occasionally plays practical jokes on Gerald. At the end of every episode Fred asks Jeeves something about himself. 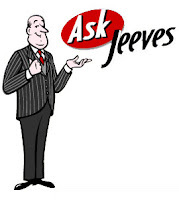 For example: Fred types in "Jeeves what's your favorite color?" To which Jeeves replies, "Black like my suit, Fred." When I get a video camera I will shoot the pilot of this show and shop it around. I really see this being a huge smash hit. If I had money I would fund this. It has some great potential. "It's about a detective who gets clues not from a pimp nor ho, but from Ask Jeeves." This is the best TV Show Idea Yet. Even better than Duke and Duke. This article sadly got no love. I think it's one of my best TV show ideas. I GAVE it love! And as I said in my love-giving, I agree that this is the best TV show idea!! This is great because it mentions Ask Jeeves, which is the most dated internet site on the world wide web.